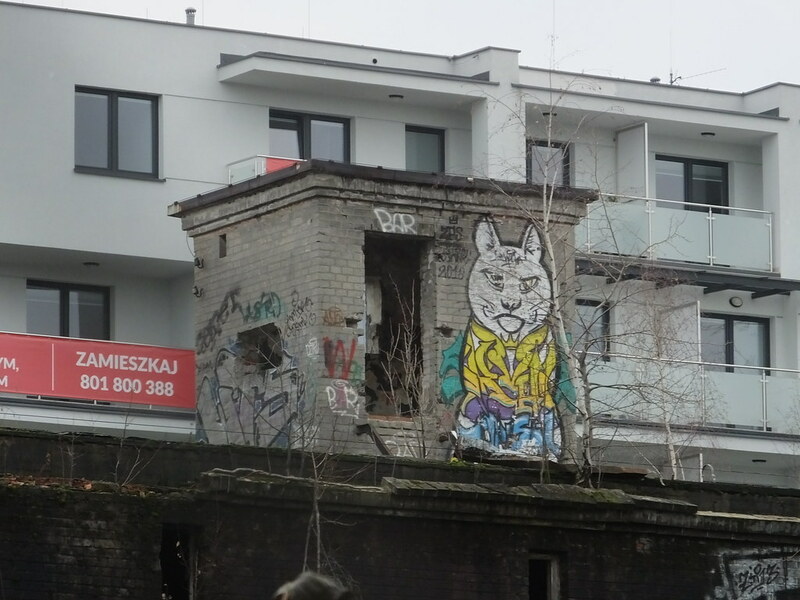 A Winter trip to Warsaw in Poland and a so called trendy area of the city called Nowa Praga located just over the river to the east. 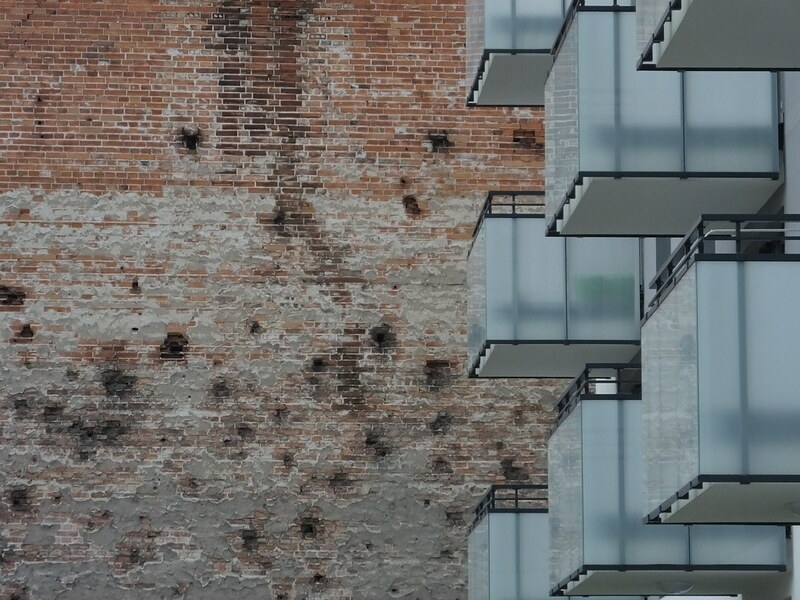 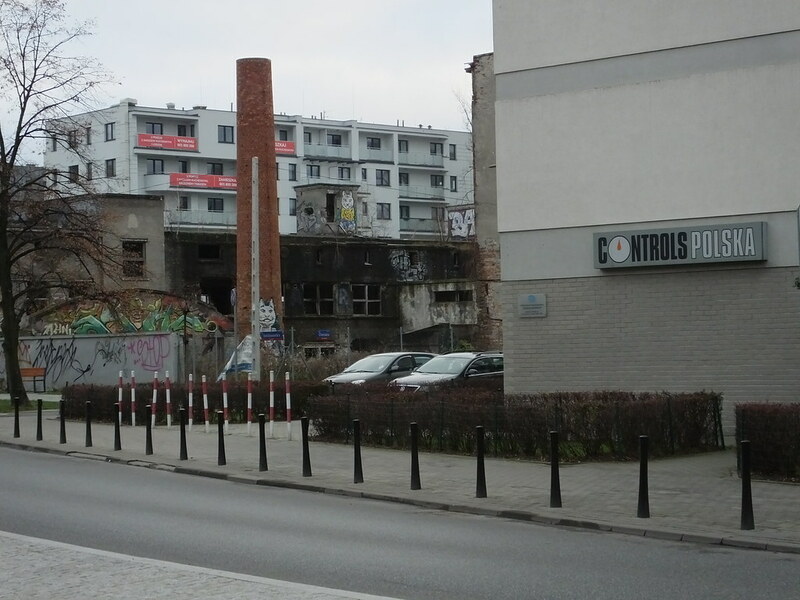 As gentrification takes place around every corner – the heart of vintage Poland is being ripped out of the city and replaced with stunning apartment blocks and reams of coffee shops. 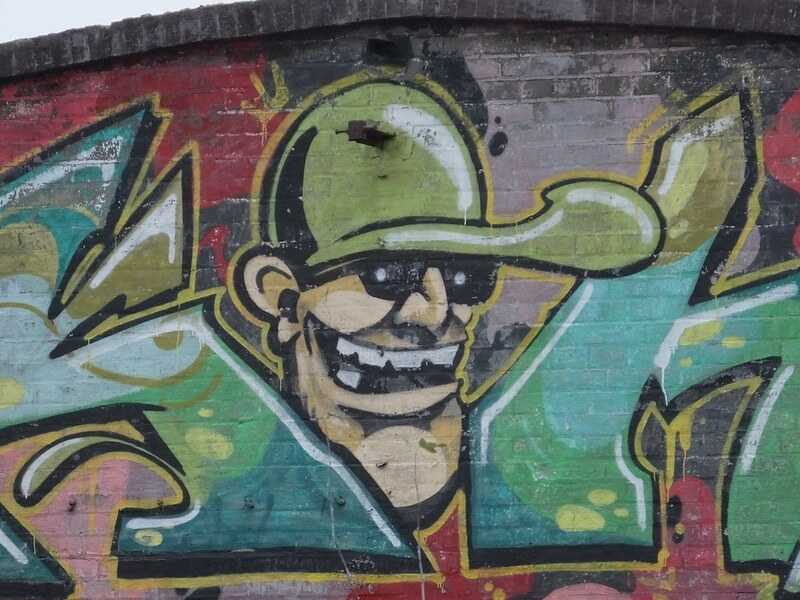 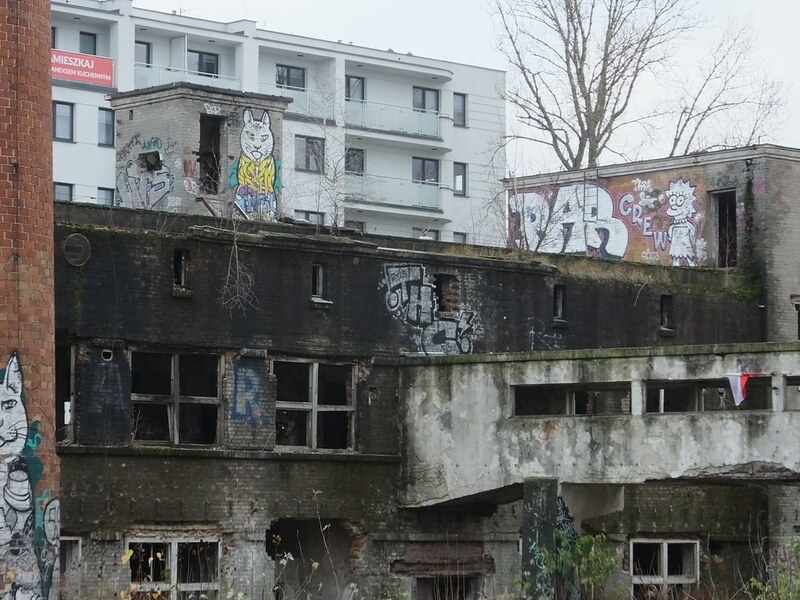 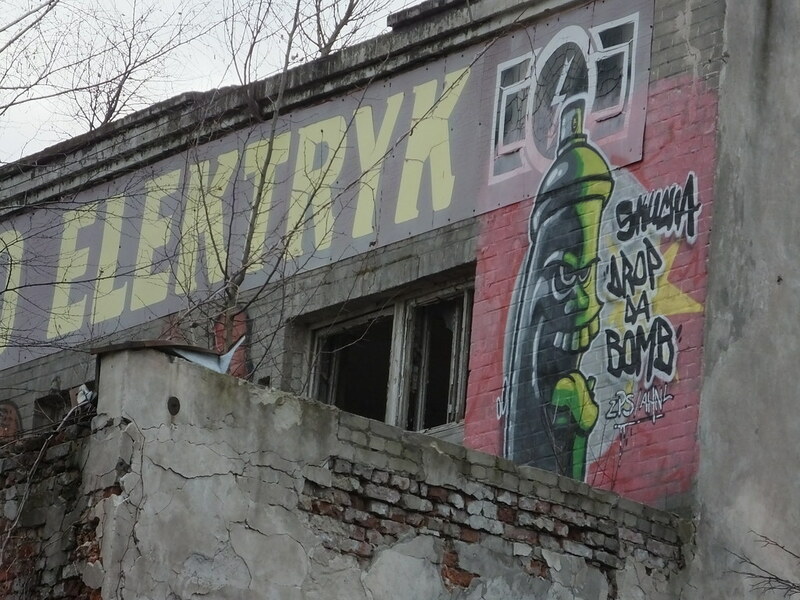 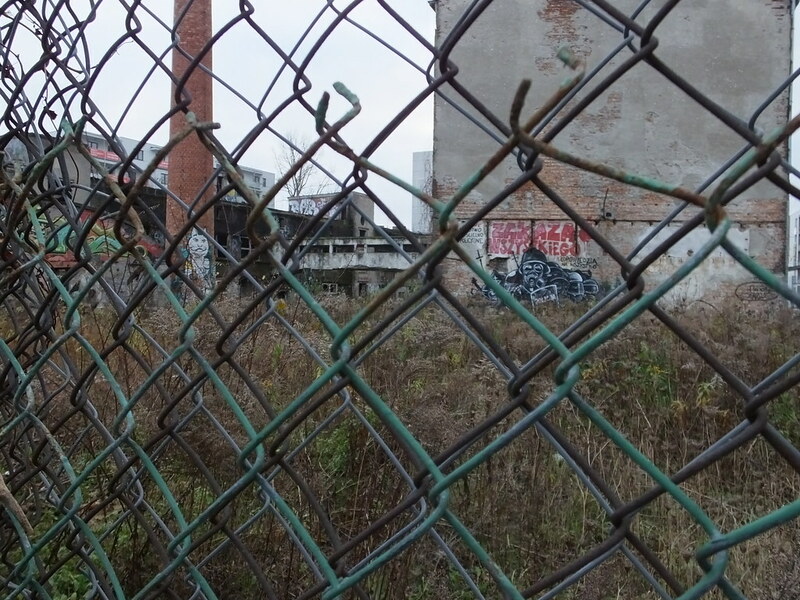 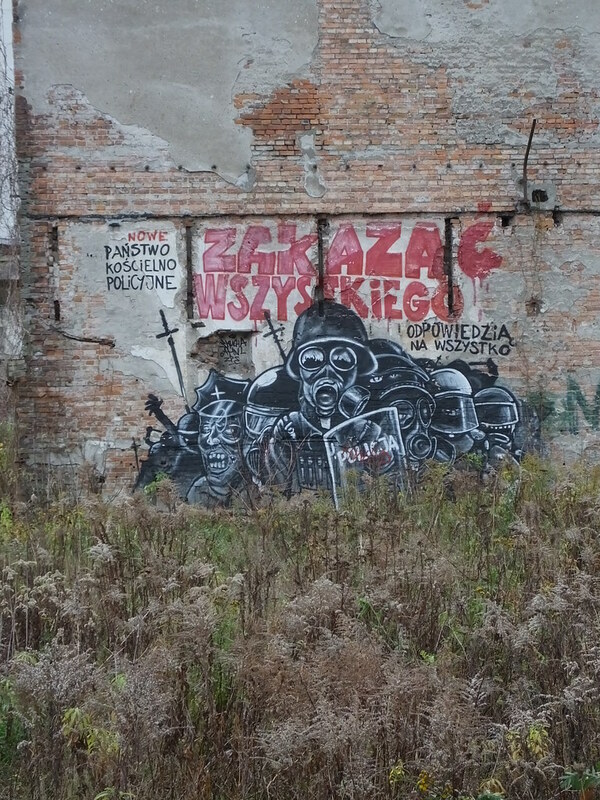 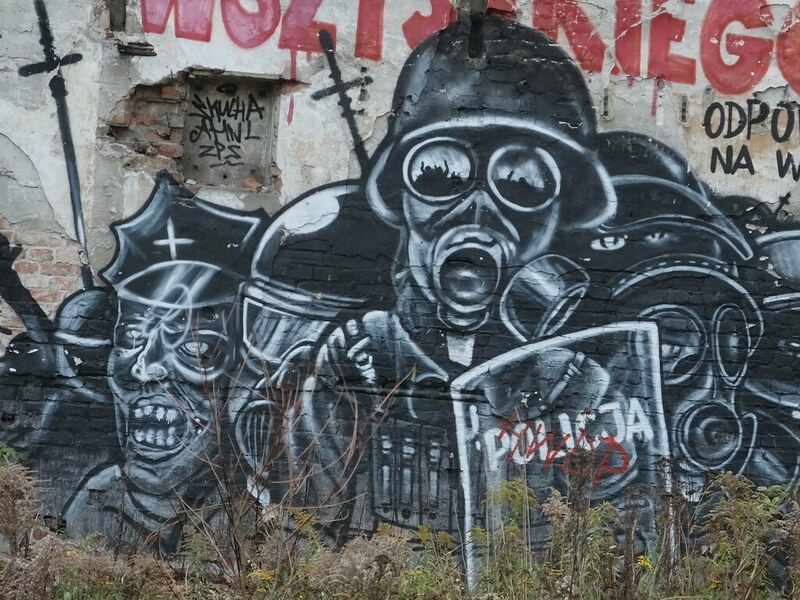 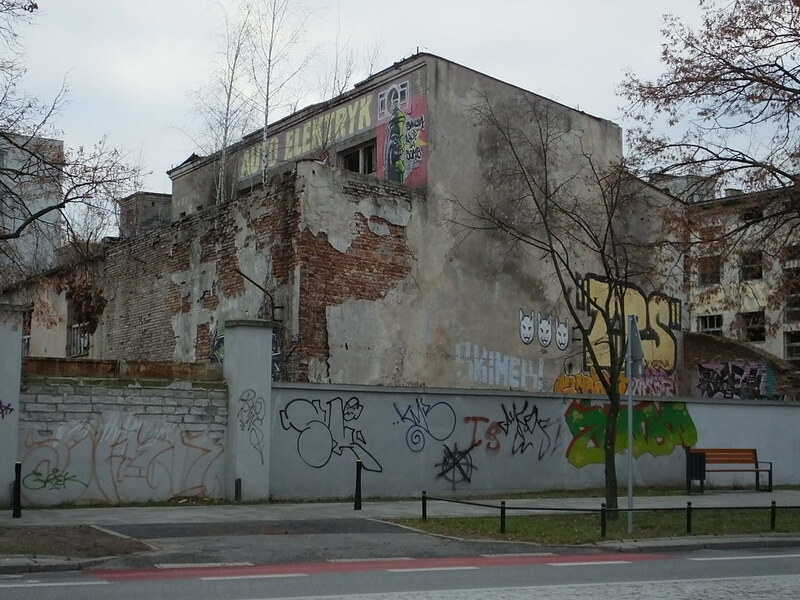 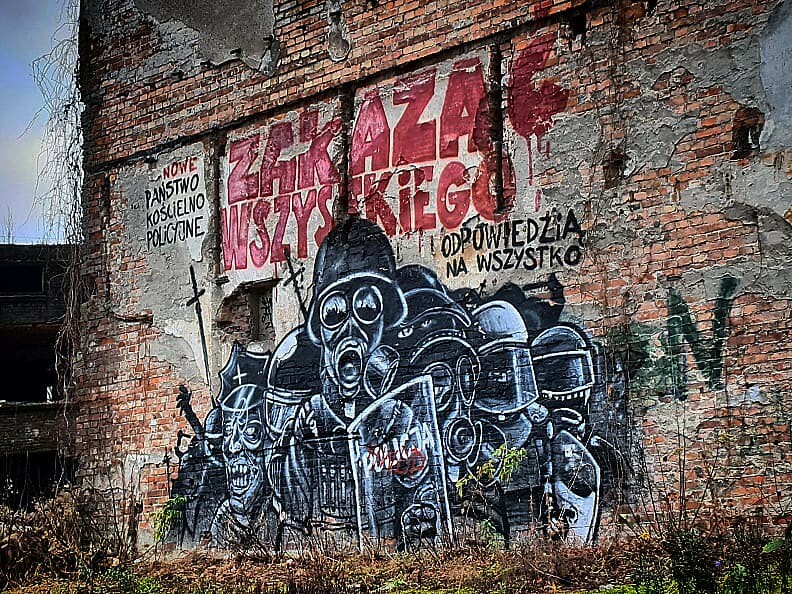 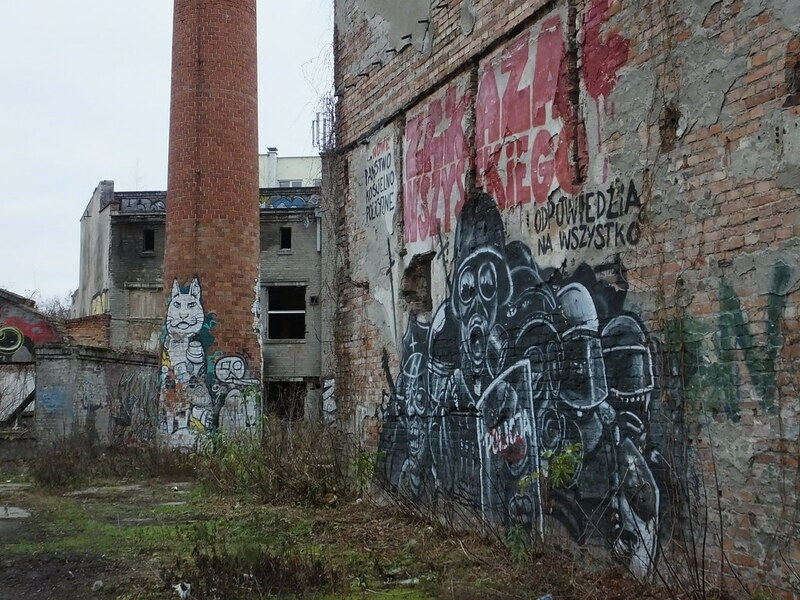 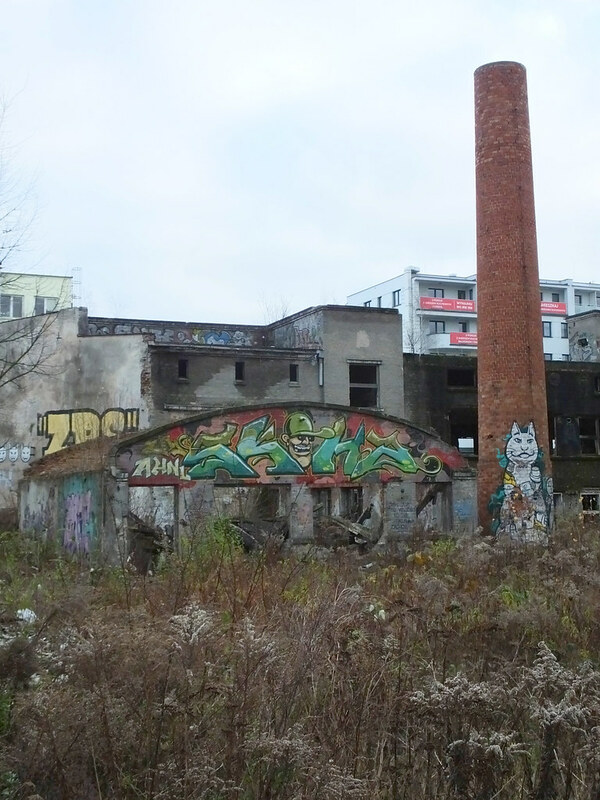 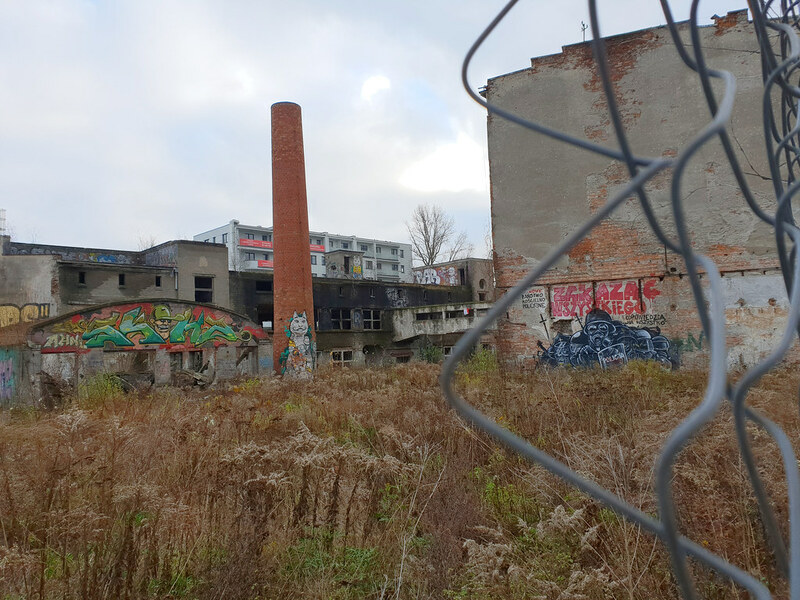 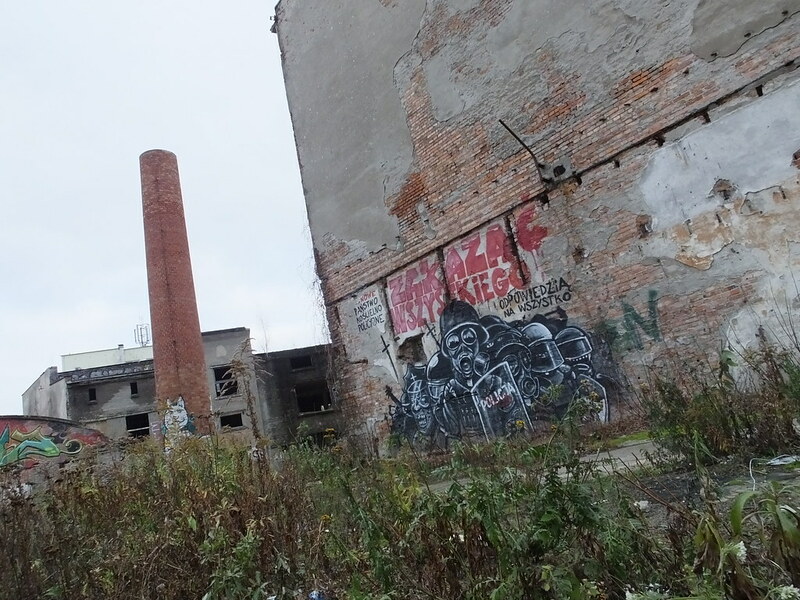 One building’s fate – on Kamionek at 4 Terespolska St. in Praga Południe – was already decided with demolition looming but there was one last chance for some graffiti and street artists to utilise the crumbing ruins before it vanishes forever. 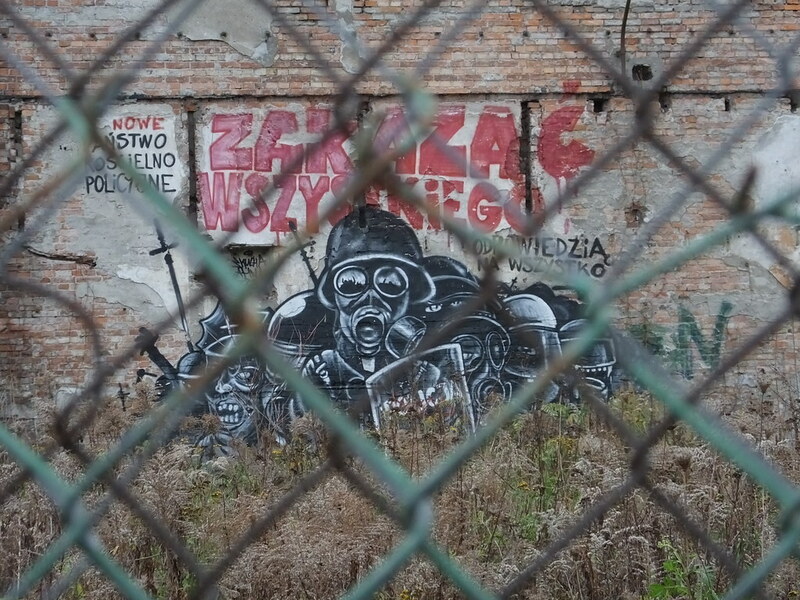 Featured above are some masked upholders of the law creating a wall against crowds of people as reflected in their visors and glasses. 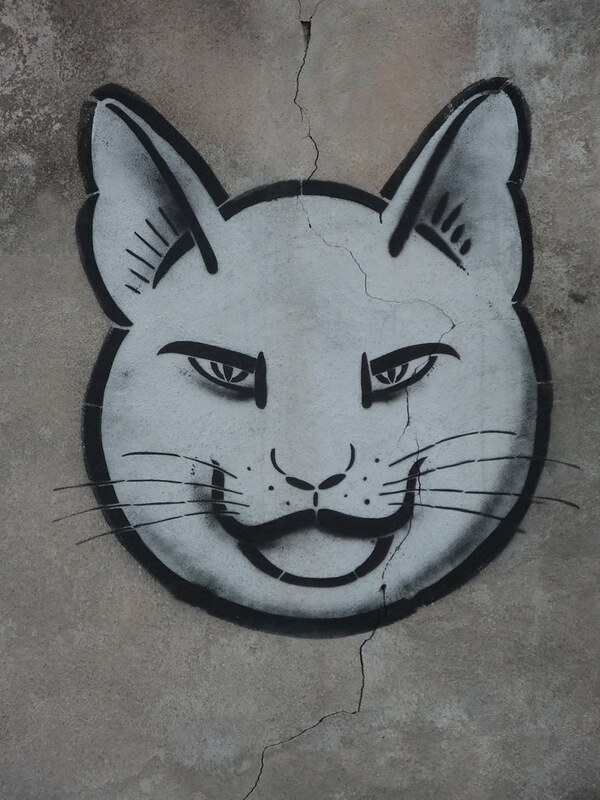 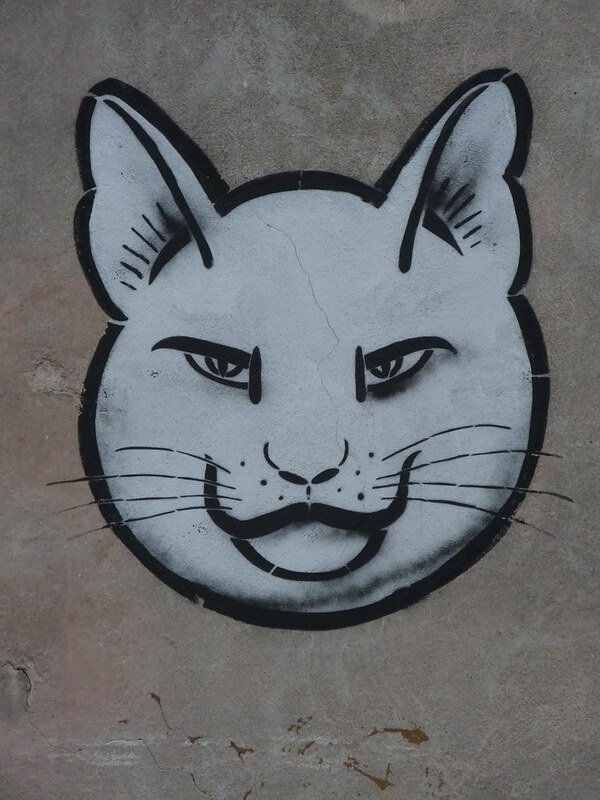 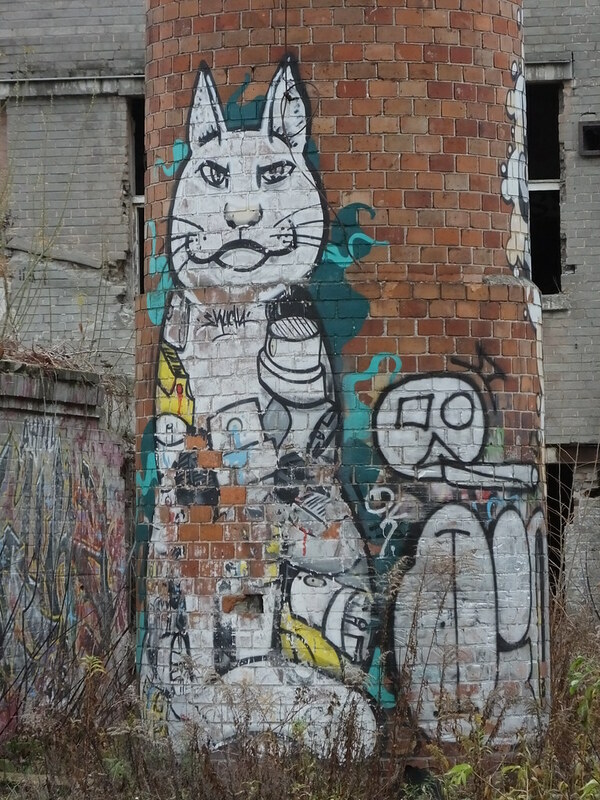 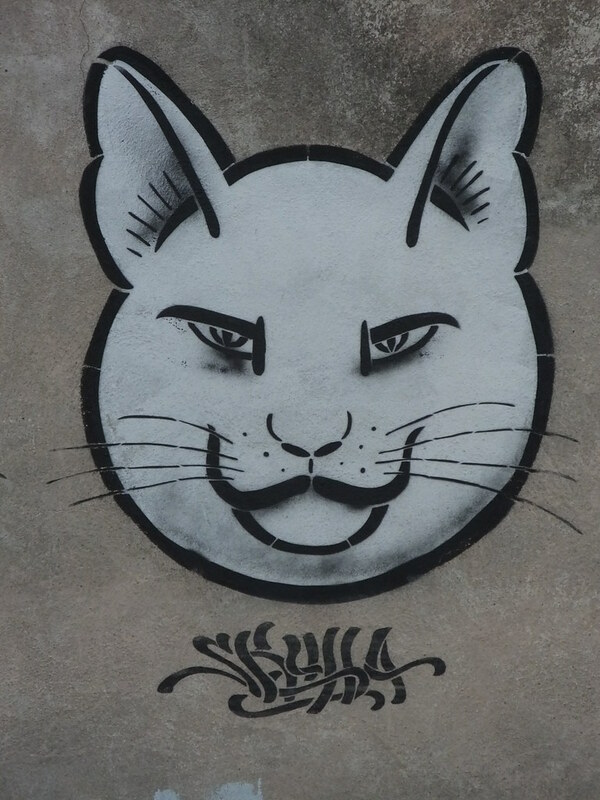 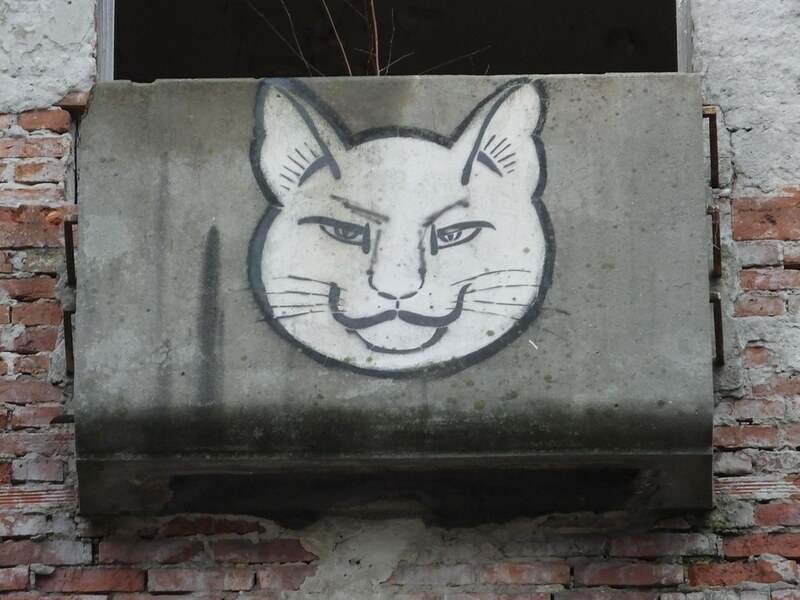 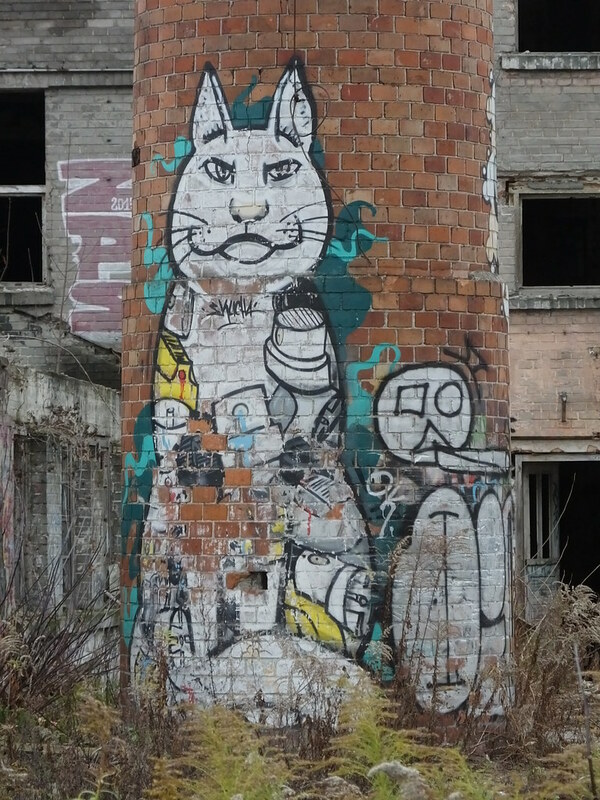 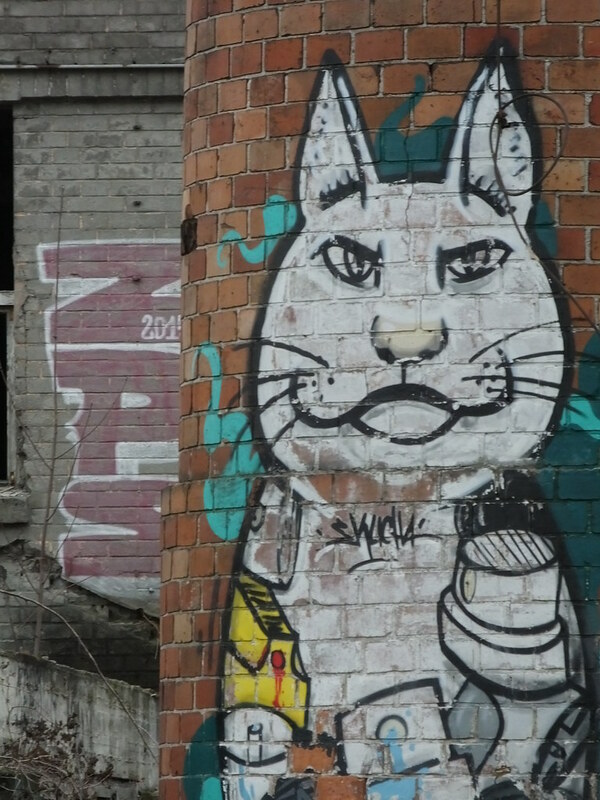 Beyond the former CORA Clothing Industry Plant there is a tall brick chimney with lots of graffiti at ground level and this cat by Skucha Ona being the most dominent. 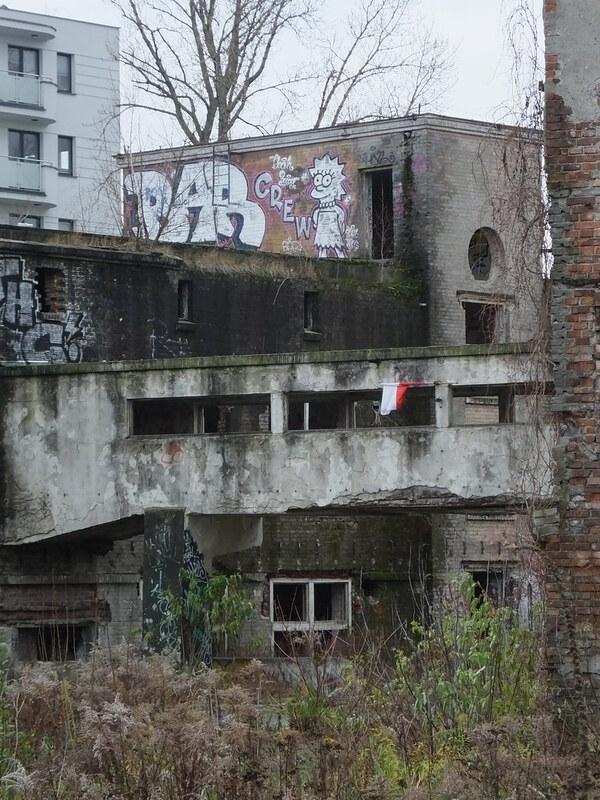 The overgrown area makes for a great foreground whilst the shell of another vacant building makes for an eerie backdrop. 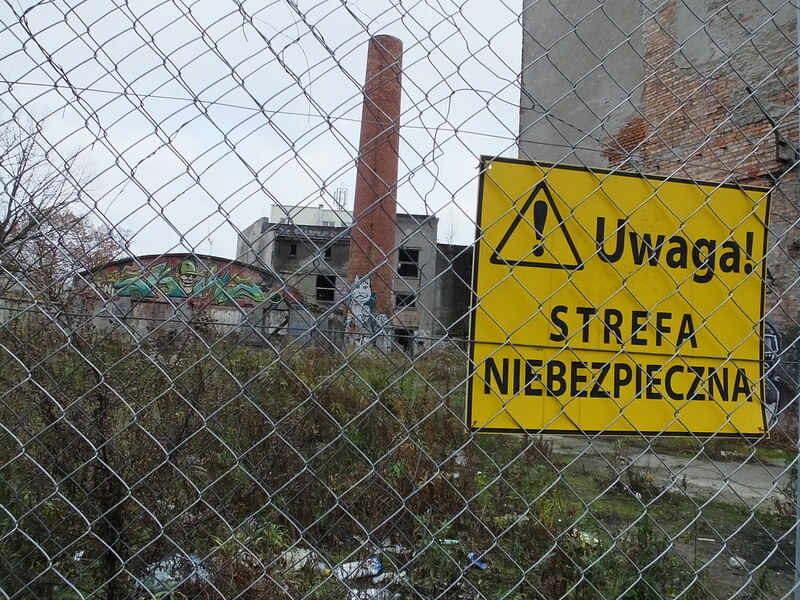 A wire mesh fence surrounds the site with ‘keep out’ and ‘danger’ signs dotted around the perimeter of the sad looking five-storey building. 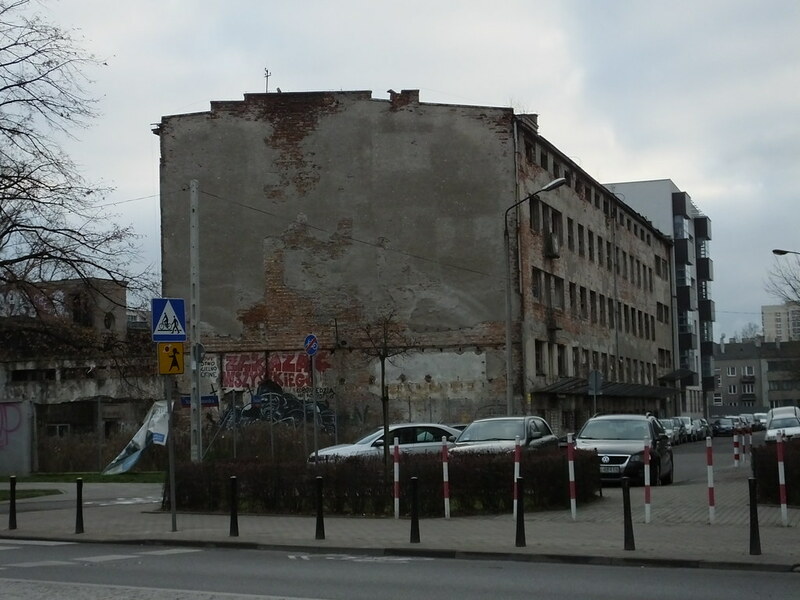 Housed here was the most famous clothing factory in post-war Poland. 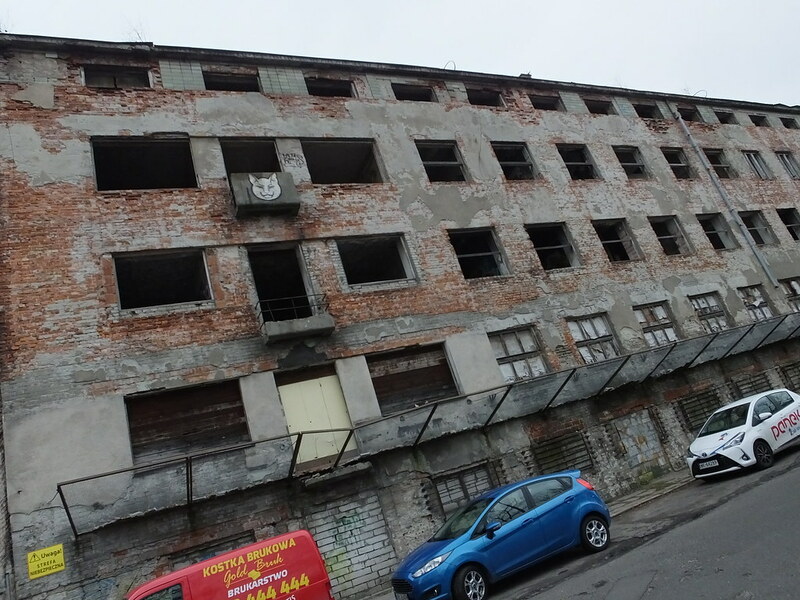 The walls of the production hall were equipped with impressive size windows but all are now vacant. 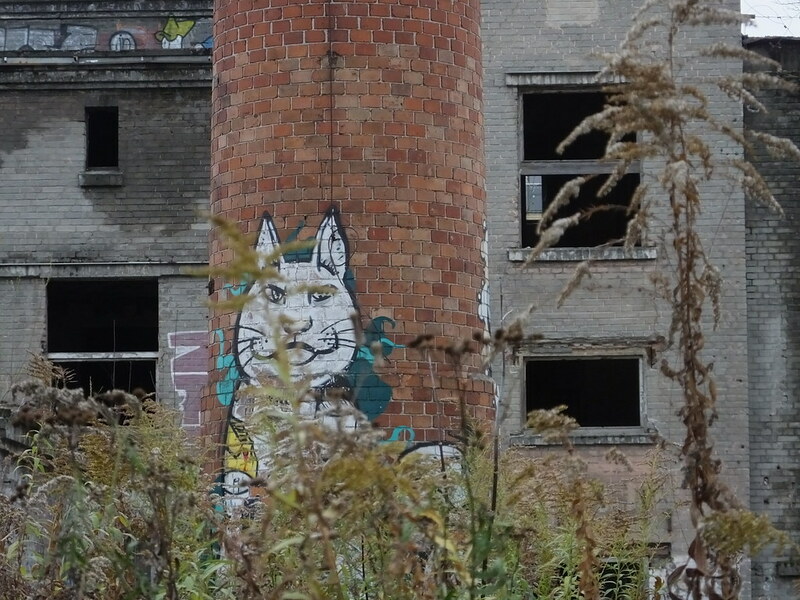 Beyond the tall chimney stack there are more general tags and graffiti with another large cat standing proud sporting a very colourful wildstyle jacket. 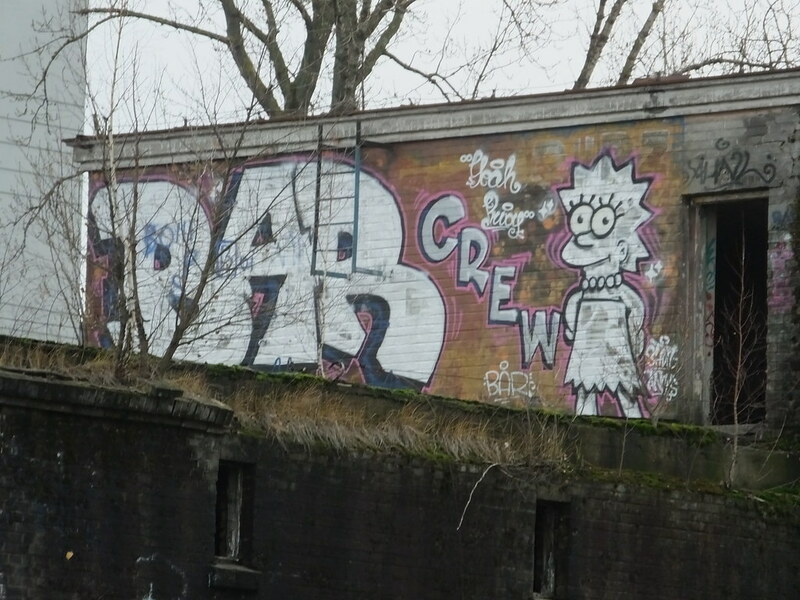 Lots of small tags are littered throughout the site with The Bar Crew providing a white Lisa Simpson with a pink outline high up on one small out building. 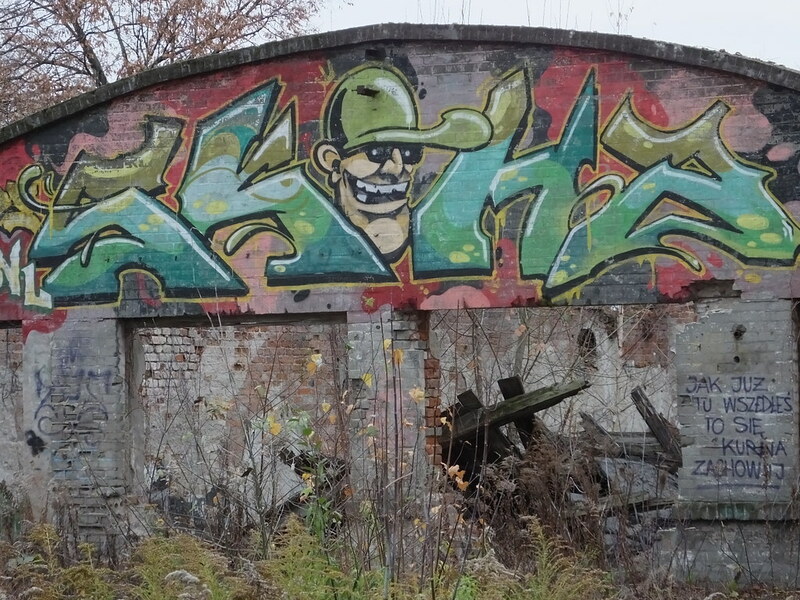 Luckily artist Skucha One recorded the painting of this beauty! 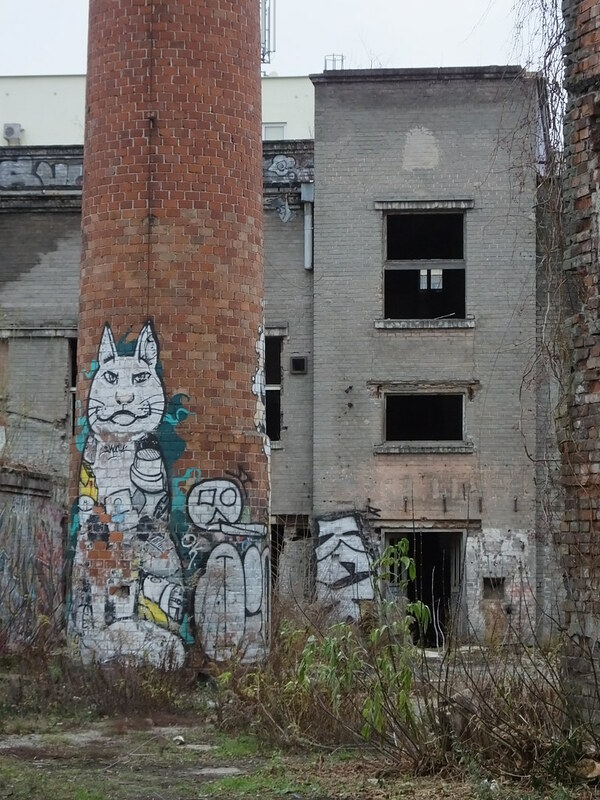 Next to the tall chimney stack is a smaller garage style building with an arched roof featuring some art from AHNL with a cool character taking centre stage. 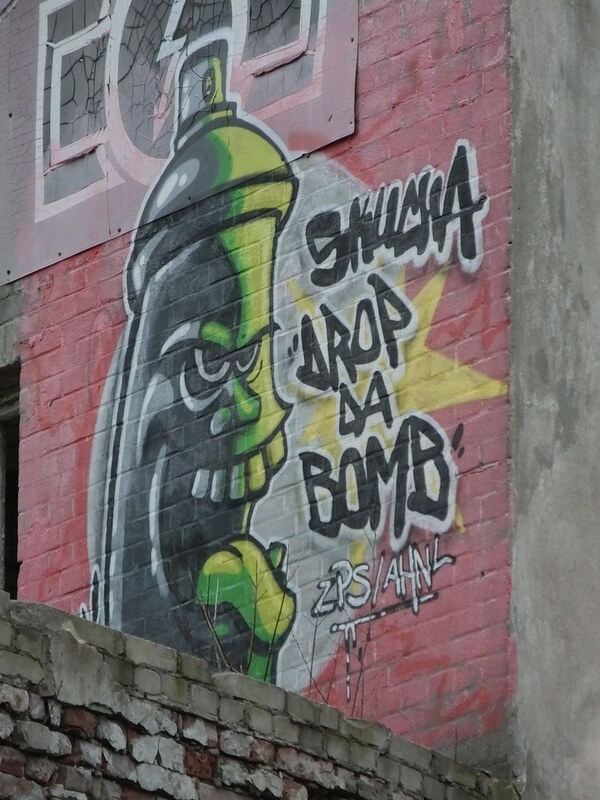 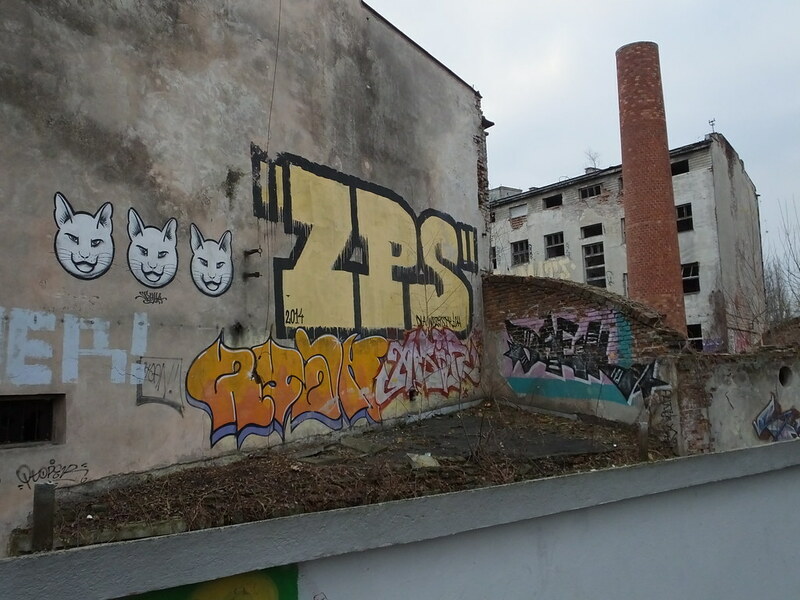 On another side of the site was a freshly rendered wall which had also attracted some tagging – whilst the crumbling wall inside featured work from ZPS and others. 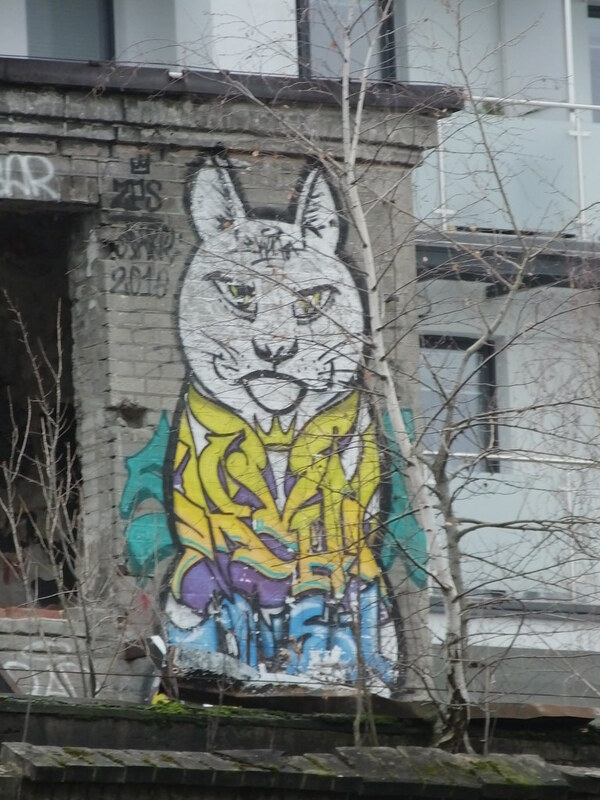 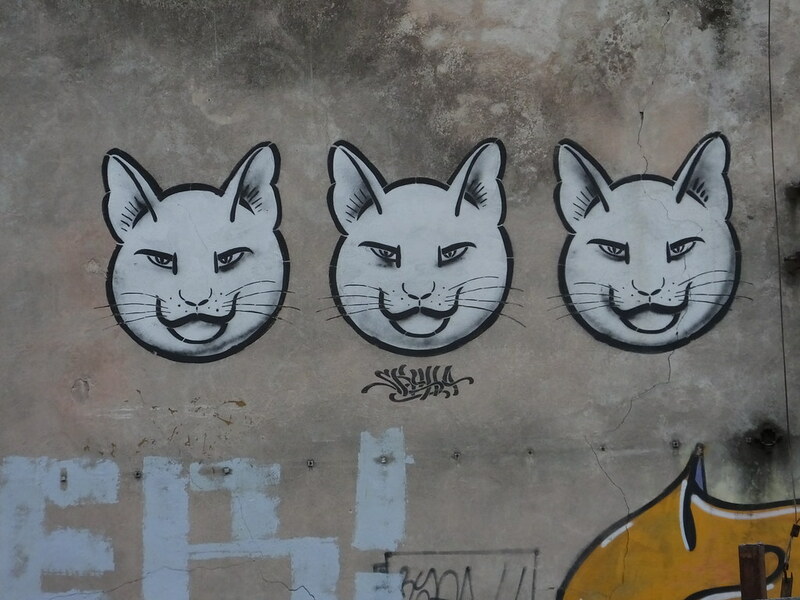 Throughout the site were many cats from Skucha One painted way back in 2016 whereas on this wall there appeared to be some freshly painted cats taking pride of place. 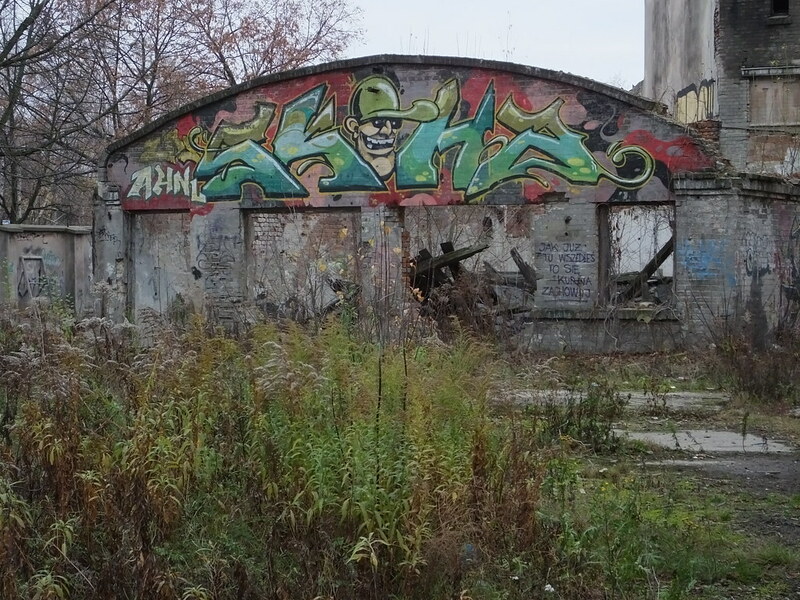 It’s always quite sad to see the remnants of the last moments of a time-gone-by to be lost forever and replaced with more of the same – but in the transition period it offers opportunity for artists to paint on a temporary canvas. 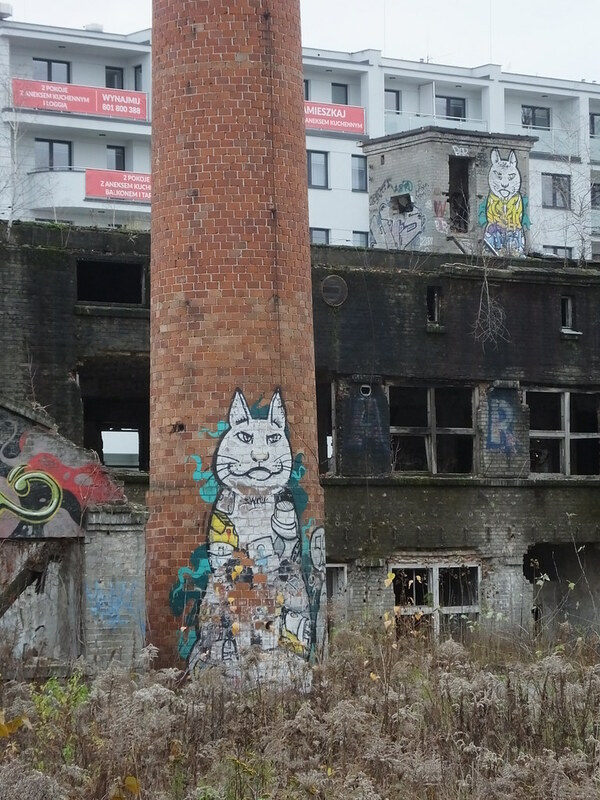 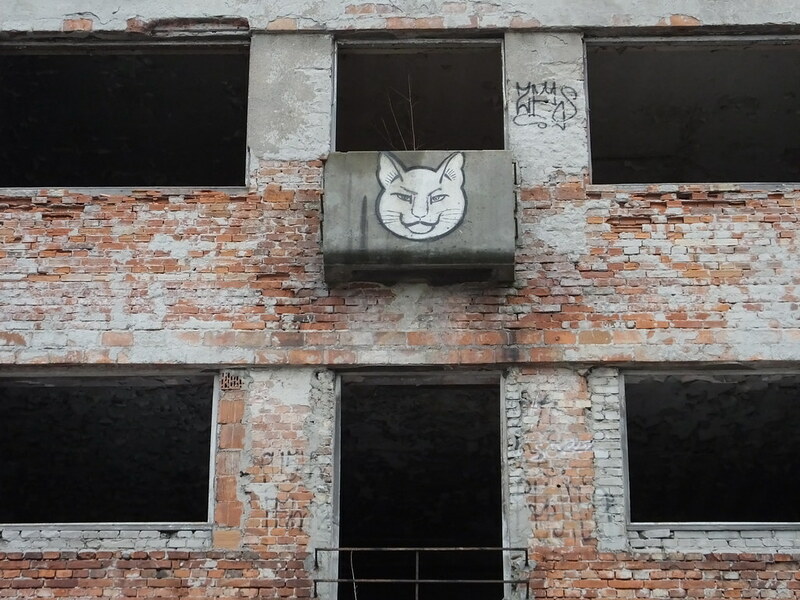 The plant first became operational back in 1949 whereas, now in 2018, demolition is imminent – but there’s always time for one last cat from Skucha – I wonder how he managed to paint this one!